I don’t know if it’s my sitting at a computer all day, the explosion of Do-It-Yourself shows on TLC, or the increased estrogen in tofu, but in recent years I have been overwhelmed with a desire to make things myself. 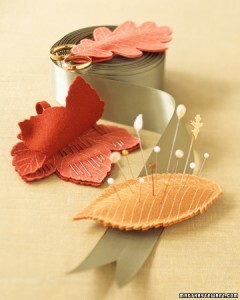 It’s no matter that I don’t even know how to sew, Martha Stewart’s leaf inspired pin cushion is just perfect for storing all the pins I don’t have! Now, every object, including and most especially garage sale junk left by the side of the road, has enormous potential to become some amazing piece for our home that is practically chic, yet funkily hip. I see a dirty, broken door wripped off its hinges lying in a puddle on someone’s driveway and think about all the money I am going to save when I turn it into an awesome, one-of-a kind headboard. My designs are of course going to gain attention, first among friends, and then amongst my neighbours who are going to love visiting the adorable, little shop I open up on the high-rent street in our area, which I of course can afford because my merchandise costs virtually nothing to make! I do realize that I have zero tactile artistic ability, not to mention that I can hardly draw a stick person that doesn’t look like it was penned by a dyslexic six-year old, but there is no reason why I can’t build that coffee table. Just look at it! It’s so easy! Last Saturday, a rare time when he wasn’t working, my husband agreed to help me pick up materials. First stop was a parking lot behind a store where I had noticed a pile of pallets. Rummaging through, I finally found the perfect one with less mud and nails than the others. “Mind if I take this pallet off your hands?” I asked the store, smiling sweetly. “Take ’em all,” said a burly man in coveralls. Next, we were on to Home Depot to pick up whatever materials the picture seemed to indicate that I needed. Usually, a trip to Home Depot involves my tapping my foot and reminding my husband that we have recently dropped an income bracket since my leaving private practice, but I finally understood the chemical reaction that overtakes the male brain in a hardware store. Every nail and piece of wood screamed at me: “Potential! Potential! Potential!” Walking up and down the aisles with my husband I was mesmerized and certain I needed absolutely everything. A circle cutter? Definitely! Pro Set 90 Lite Sand Setting Type Drywall Compound? A 16 kg bag, please! A Floating Dock Connector Kit? Throw it in the buggy! “You don’t need any of these things,” my husband said, putting them back. Forcefully leading me out of the store, my husband reasoned that I should first work on the pallet, figure out a plan and then make a shopping list. This is because he is a ‘suit’ and not an artiste like me. In our backyard, wielding a saw to cut the pallet down to the right size, I felt so competent, so alive! “Don’t cut towards yourself like that!” called my husband from the window. He seriously needed to back off. I had googled this. Honestly. After a 20 minute coughing fit, I was ready for sanding. The pallet’s serrated edges needed a lot of smoothing and I rubbed away at them as hard as I could with the small pieces of sand paper I had found in the basement. I scratched and scratched until I realized that the throbbing in my fingers was not the tingling of productivity, but massive slivers wedged in their tips. 3. Stain for whatever type of wood this is. I’m practically Mike Holmes. I called my husband out so he too could bask in my success. “Well,” I said, “What do you think?” I raised my arm so he could behold my work. My husband circled the table, the dog following at his heels. “I’m just thinking about all the wood we’re going to have to recycle.” He turned and went back to the television. What does he know, anyway? The guy’s sawing skills are completely out of date. Diego licked my nose and wagged his tail. I was comforted by his loyalty and obvious taste in work-in-progress furniture. He stood for a moment, surveying my work. Then, looking right at me with his sweet, caramel eyes he lifted his leg and peed all over my coffee table. That’ll be my husband’s end. Wendy, this is sooo funny. You are a very talented writer. Thank you soooo much! Your comment makes the slivers totally worth it. a) I don’t even know what a pallet is. . .
c) Remember the infamous chair incident of 2002? Let us not forget. d) Love the article. Hilarious. I’m so sorry about the chair. I really am. But given my superior knowledge in construction (as evidenced by point (a) above), I don’t think it’s crazy that I insisted on being Project Manager. I did let the power go to my head though, and, for that, I am truly repentant! What an amazing writer you are. That was so much fun! I feel your pain (ie. slivers) and totally agree with you about the new techniques for sawing and sanding (could you please do a video so I can google it?) Loved the post.